To OP yourself on your server follow these steps. 2. 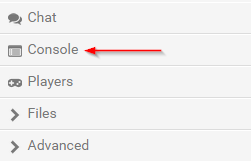 On the left-hand side menu, click on Console. 3. Type in the following command: op steve (steve being your Minecraft username) and press Send. 4. You will now see a confirmation message in the console that you have been OPed on your server. For newer versions of Minecraft, there are different permission levels that can be set as a 1-4 value in server settings by editing the op-permission-level option. By default, it is set to 4. As you can see if you want to have OPs to have access to everything, the op-permission-level will need to be set to 4.